The Nutri Ninja BL 642 Blender Duo with Auto iQ is ergonomically designed to extract most juices from fruits and vegetables within minutes. Incorporated with a 1500W motor, this blender will deliver a power packed performance with minimal effort. It has an Auto iQ technology that helps in chopping and blending whole fruits with just a single button. The appliance has pre installed programs that make your juice extracting task quicker and without the need for stirring the contents. It has sharp Pro Extractor blades that slice each fruit into tiniest of pieces and makes the best smoothies. 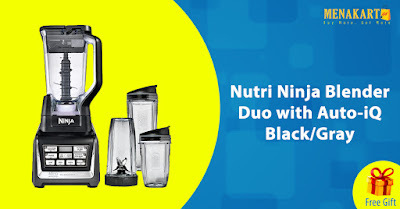 This Nutri Ninja blender is composed of BPA free plastic that looks attractive as it flaunts a black and gray color combination.